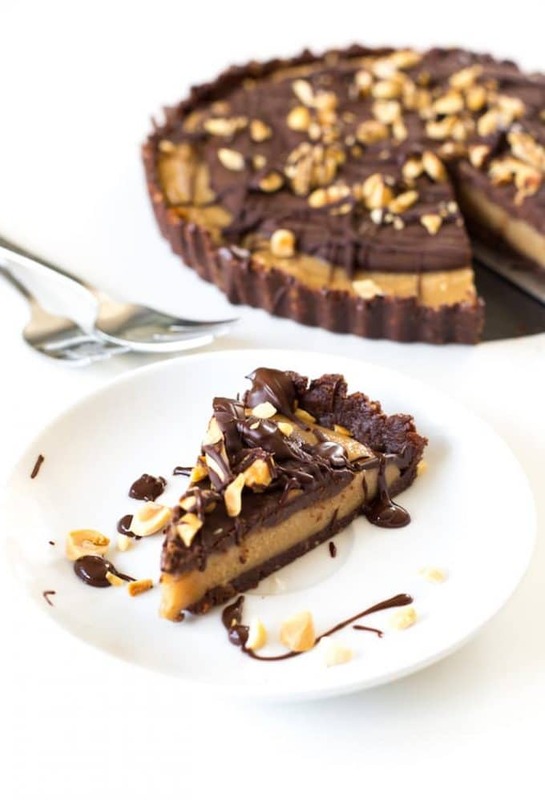 It’s been about 5 minutes since I last shared a peanut butter + chocolate recipe on here so clearly it’s time for a little more PB love. If you’re into crazy delicious, no bake summer treats that are equal parts easy and downright decadent, then scroll on my friend. Scroll on. 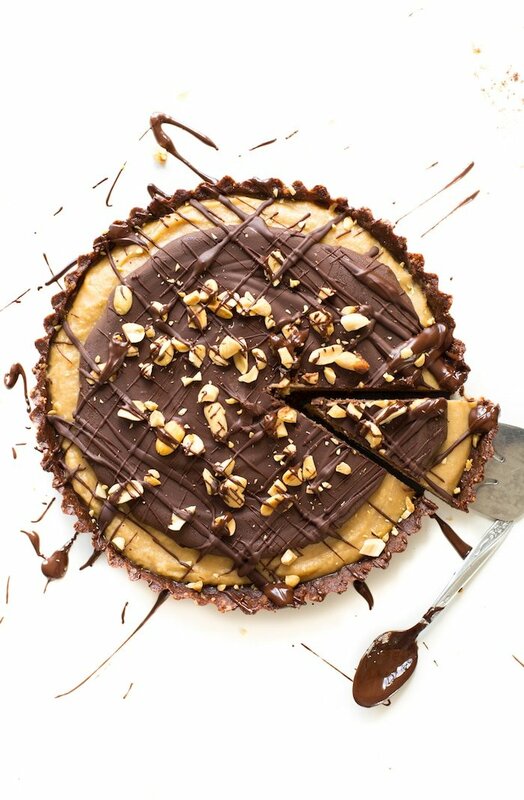 Basically every peanut butter & chocolate lovers dream. Assembling this pie really only takes about 15ish minutes and requires less then 10-ingredients. You will need to let this set in the freezer for at least 30 minutes before serving to firm up a little bit. I’ve made this twice in the past week alone and thank goodness we’ve had friends over to help us get through this pie. A little bit really does go a long way here in terms of serving size. Just a little slice is all you need to satisfy even the most intense chocolate craving. 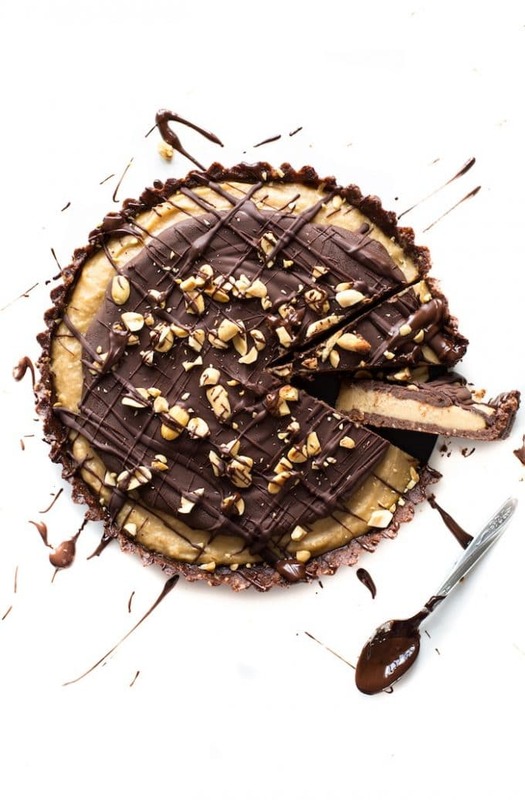 Don’t forget to #asaucykitchen on instagram if you try this Frozen Peanut Butter Pie! We love seeing what you make! You can also post your pictures to my facebook page – those are always fun to see! Add the dates & nuts to a high powered blender or food processor and pulse until crumbly & sticky. Add the cocoa powder & coconut oil and blend again until combined. The mixture will start to stick together as your blend. Stop and scrape the sides of the blender/food processor as needed. Transfer the crust to an 8 inch round tart tin with a loose bottom. Push the crust into the sides and bottom in an even layer. Set aside while you make the filling. Add the peanut butter, coconut cream and sweetener to a mixing bowl. Whip together by hand or with an electric mixer until smooth and combined. Pour the filling over the top of the crust and then transfer to the freezer while you prep the chocolate. Stir the chocolate as it melts. When there are only a few chunks of chocolate left remove the bowl from the heat. The residual heat will be enough to melt the rest. Stir in the coconut milk. set aside the chocolate & let cool. Once the chocolate has cooled down pour it over the top of the peanut butter filling. Use a spoon to spread the chocolate around towards the sides. Sprinkle the chopped peanuts over the top. You can serve as is or place in the freezer for 40 minutes to firm up more. Store this in the fridge or freezer. If you keep this in the freezer for over an hour let it that on the counter for at least 15 minutes before attempting to cut into. Is the coconut cream and coconut milk both from the can? Thank you so much for this fabulous recipe! I had a PB pie craving and made it to share with guests. Wasn’t sure how well it would go over, but it was a winner! I didn’t have coconut cream, so I subbed with some cream cheese (non-vegan) but going to plan ahead for that next time. It is delicious! Of course, kiddos asked for seconds, thirds . . . One guest asked for the recipe 🙂 Thank you again! Thanks Heather – so happy to hear that! A fantastic dessert!! Only issue for me was that when I added the coconut milk to the melted chocolate it ‘thickened’ up the chocolate (so instead of being runny it was very thick and difficult to spread). What might I have done wrong? Hi Tania! So glad you liked it! What was the coconut milk temperature like? Sometimes when working with coconut milk I need to warm it up a little bit to make it easier to mix. I think it probably needs to be at least room temperature when mixing it all up so that it’s easier to spread at the end. I’m gonna make a note of that in the recipe! I have made this several times and it’s always a crowd pleaser! That’s so awesome! Thanks for coming back to let me know what you think! Hi! What percentage of dark chocolate do you recommend? Can’t wait to make this! Hi Natalie! We usually use around 70% but you can use whatever percentage you’d like! What a great and simple recipe. 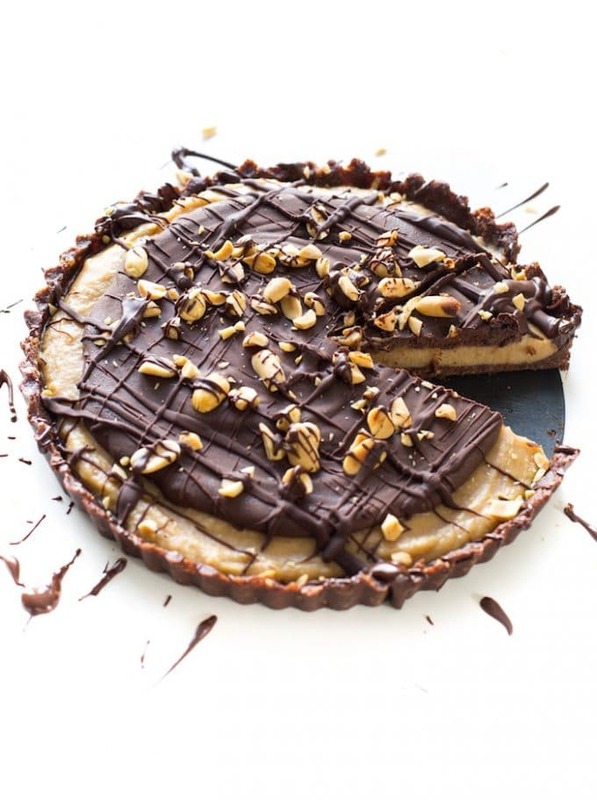 I love peanut butter and the pictures are absolutely – well delicious looking!! Do you use a combination of nuts or just one, of your choice, for the crust? What would be a good sub for the coconut cream? My hubby does not like coconut. Cashew cream maybe? I haven’t tried it with cashew cream myself but I do think that it would work! You could soak 1 1/2 cups cashews and then blend it up with the rest of the filling ingredients and that should do it! I don’t have a tart pan, is there another pan/dish that would work? Ideally if you have some sort of pie, cake, or brownie pan with a bottom that comes out that would be best – it just makes removing the pie a lot easier at the end. If not you could always line the bottoms and sides of whatever pan you use with non stick baking paper and just pull out the pie when you need to cut it into slices. How long can you keep this pie in the freezer? A few days? Hi Dilan! You should be able to keep this at least a couple of weeks in the freezer – probably even longer than that but we usually finish it before too long. Would this be the coconut milk in a can or just in the alternative milk section (carton style)? Is there anything I can substitute for the dates (not raisins)? Thank you, I can’t wait to make this. This pie looks deliciously decadent. I think it shall be the dessert I bring to our next neighborhood potluck! 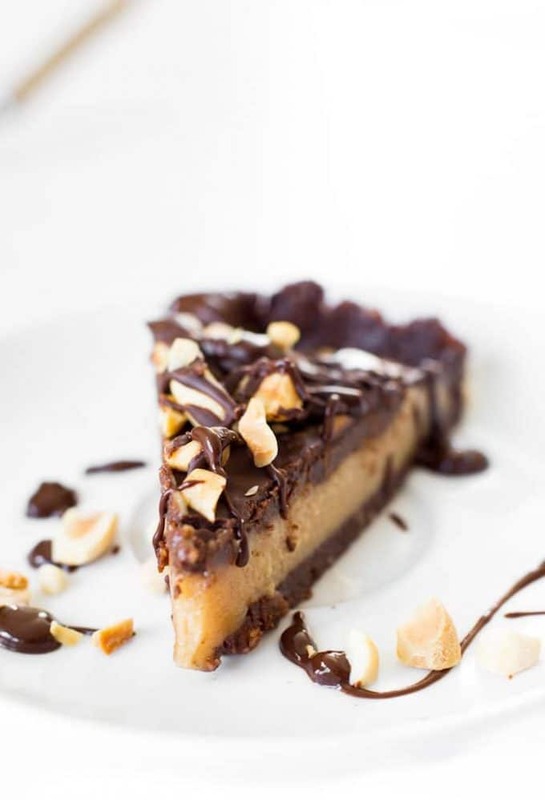 So true – chocolate + peanut butter forever! Thanks Bethany! Killer! This is killer! But OMG so loving all the natural ingredients!